The Los Angeles rental agency comments on a recent article that LA’s biggest drawback can also be its one of its greatest pleasures. Traffic in LA isn't always heavy, but it's definitely a fact of life. The most reliable antidote to traffic related stress is to simply have the finest, most luxurious car you can find and enjoy the comfort and high-end features which can make driving a genuine pleasure. An April 30th article on Gothamist explores the annoyance associated with a recent New York City subway-based ad campaign sponsored by the Los Angeles Tourism Board. Ads included idyllic images of Los Angelenos enjoying the sun and beauty of California, which seemed to some like an attempt to rub the noses of shivering Easterners during this spring’s Nor’easter. 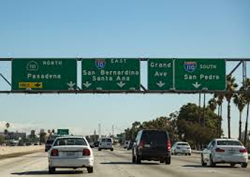 The article opines that the ads' copy “LA (Hearts) the Morning Commute” is not really the case, as LA residents mostly have to brave some of the nation’s heaviest traffic in their cars on a daily basis. Luxury Line Auto Rental says that there’s no way to deny the reality that heavy traffic, especially during rush hour, is a fact of life throughout the metropolitan areas of Southern California. At the same time, for vacation visitors and business travelers alike, there are a number of ways to take the edge off of heavy traffic and that includes driving one of the finest cars on the road, say the rental agency. Experienced Los Angeles area commuters all have their own ways of reducing commute times and making the time they’re spending in their cars a great deal more pleasant, says Luxury Line Auto Rental. Many have become fans of podcasts and books on tape, others listen to music they’ve downloaded. Angelenos frequently swear by traffic apps like Waze, which can be especially useful in a city like LA where alternate routes to avoid the worst the traffic often abound. Many also try to avoid the morning and late-afternoon weekday peak traffic hours, even if they seem to amount to nearly half of the day, says the agency. However, the most reliable antidote to traffic related stress all is to simply have the finest, most luxurious car you can find and enjoy the comfort and high-end features which can make driving a genuine pleasure, says Luxury Line Auto Rental. At the same time, believe it or not there are times and places where traffic won’t hem you in and automotive enthusiasts can put the pedal to the metal and savor the power of world class sports cars, says the agency. From Mulholland Drive to the deserts and coastlines, some of the greatest places in the world to drive can be found throughout Southern California and beyond, says the firm. Luxury Line Auto Rental adds that the constraints imposed by heavy traffic can also make the experience of opening up the engine when you finally hit the open road all that much more sweet – and being in the finest rentals cars available will be a lot more than the icing on the cake! Luxury Line Auto Rental says that it offers many of the finest vehicles in the world for both visitors and California residents. Its roster includes the best pf Mercedes Benz, BMW, Porsche, Ferrari, Maserati, and Rolls Royce. The agency also offers pick-up locations throughout the Greater Los Angeles area as well as in San Diego to the South, San Francisco and San Jose to the North, and Las Vegas and Phoenix to the East. The agency says that clients can find not only outstanding vehicles, but first rate customer service that definitely won’t add to any roadway stress. To find out more about Luxury Line Auto Rental, contact the agency at (310) 229-0001 or visit online at http://www.LuxuryLineAutoRental.com.